Compare the V-J junction sequence with the extremities of the corresponding V and J "germline" genes (see IMGT Repertoire > Alignments of alleles). It is the case of V and J genes of IGK, IGL, TRA and TRG loci. When we read the IMGT annotations (in IMGT/LIGM-DB), we note that this rearranged sequence of a kappa light chain comes from the genes and the alleles rearrangement: IGKV2-28*01 [or IGKV2D-28*01 (identical score)] and IGKJ2*01.
deletions at the 3' end of V gene and at the 5' end of J gene: 3 nucleotides deletion TCC at the 3' end of the IGKV2-28*01 allele and 2 TG nucleotides deletion at the 5' end of the IGKJ2*01 allele. nucleotide addition of nucleotides not coded into the germline sequence: one C nucleotide added. Compare the V-D-J junction sequence with the extremities of the corresponding V, D and J "germline" genes. It is the case of the V, D and J genes of IGH, TRB and TRD loci. 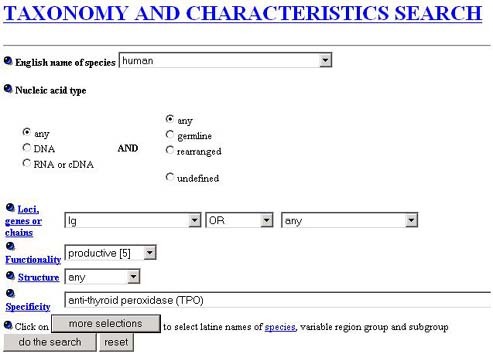 Example: the rearranged sequence with accession number AF052379. When we read IMGT annotations (in IMGT/LIGM-DB), we note that this rearranged sequence of an heavy ../_FRchain comes from the genes and alleles rearrangement: IGHV5-51*03, IGHD1-7*01 and IGHJ4*02.
deletions at the 3' end of V gene, on both sides of D gene and at the 5' end of J gene: 2 nucleotides deletion at the 5' end of the IGHD1-7*01 allele, 4 nucleotides deletion at the 5' end of IGHJ4*02 allele. In other sequences, we could also observe deletions at the 3" end of the V gene. nucleotide addition of nucleotides not coded in the germline sequence, N-diversity regions, N1 and N2: insertions of 2 nucleotides CT (N1) between V and D, and insertion of 5 nucleotides TCTCG (N2) between D and J. Is it easy to identify a D gene? Why? 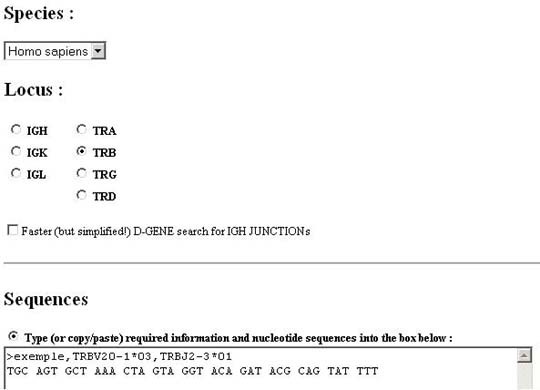 No, it is not easy to identify and locate a D gene in a V-D-J junction. Indeed, it is a short gene (only a few tens nucleotides) which may have somatic mutations, deletions and nucleotide insertions (N-diversity) at the 5' and 3' ends. Locate the nucleotide sequence of the junction [from the cystein (c) codon at position 104 to the tryptophan (W) or phenylalanine (F) codons at position 118]. F or W is identified by the characteristic pattern F/W-G-X-G of the J gene. Keep the IMGT/V-QUEST window and open a second one (File > New Window). Consult IMGT/JunctionAnalysis Documentation to see how to present your request into the window. are there some P nucleotides? The CDR3-IMGT is 11 amino acids long. Indeed, Cys 104 (2nd-CYS) and Trp/Phe 118 (J-TRP/J-PHE) are not included into the CDR3-IMGT. In contrast, they are part of the junction and mark the junction ends.